The safest site on the web for storing your text! You find it - it's yours! Encrypt all your notes, access anywhere. Simple. Fast. Free. No ads. Secure - don't trust us, check the code yourself. Your password isn't sent to our server - we can't decrypt your text even if we wanted to. Only encrypted text is sent over the Internet. No cookies, no sessions, no registration, no users tracking. We can't identify you at all. We can't know when the same user visits two different sites. No logging in or out, just close the browser tab and you're safe. No ads - we hate ads because they can track you, and they're distracting. You don't have to trust anyone or agree on anything - check the code yourself. All our code is well written and full of comments so that you can understand it in details - start by looking at main.js, and check communication with our servers. If someone wants your text, he'll need your password, but he'll have to find your site first. You can use the same sub-site from multiple browsers/devices at the same time, without having to worry about ever losing any changes. Q: I've forgotten my password, what can I do? A: Passwords are never sent to our servers. We only store encrypted text - which is useless data once a password is lost. Also, we don't know who this text belongs to. 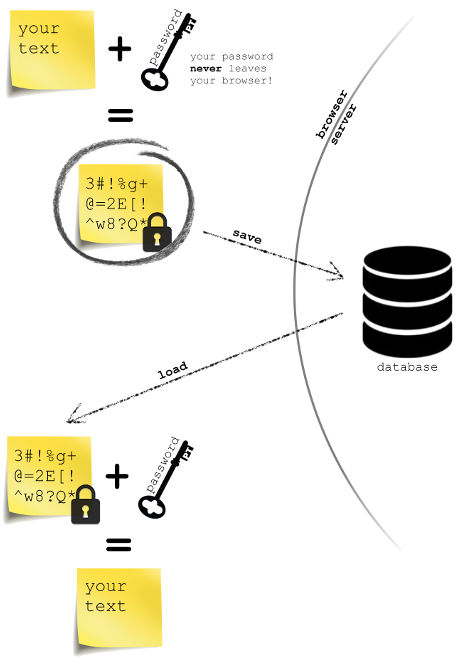 Q: How can I make encrypted backup of my notes? A: It's simple: Open your site with Google Chrome or Mozilla Firefox and save the site before decrypting it (Ctrl + S should work). Make sure to save the site while 'Password required' dialog is still visible. To open your encrypted backup, open saved .html file and type in your password. Q: Why is my URL changed from "Mark's notes" to "mark-s-notes"? A: Some characters aren't allowed in URL addresses, that's why your URL is redirected to a URL that has some characters replaced with dashes. You can always type in "Mark's notes" and you'll be redirected to the same URL. Q: Can I make a site public? A: You can add the password after the URL of your site, like this: ProtectedText.com/yourSite?yourPassword which will automatically decrypt yourSite with yourPassword. Q: What are your long-term plans? How will you react to legal pressure? A: We'd like to create a file storage and sharing service with a similar security approach. In case of legal prosecutions, we can't hurt users because we don't know anything about them, and we can't decrypt their notes. If needed, we'll relocate servers to another country or start implementing easy-to-use self-hosting solution. Q: Why is this better then Evernote? Q: Do I have to use a long password? A: You don't have to, but it's recommended. The longer the password, the harder it is to guess it. Note that your text is protected by both the URL and your password. Q: Can I use a suspicious internet connection (e.g. Starbucks)? A: Yes. Your password (or password hashes) are never sent over the network, and all data that's sent or received is always encrypted. Your data is decrypted only on your device, and encrypted before it's returned to us. Q: How can you verify that a password is correct if you don't store it anywhere and don't send it to server? How do you authenticate the user? A: The server doesn't know anything about authentication; that's all handled in your browser. There are no users on ProtectedText.com, just sites. Passwords are never saved; not even within encrypted text. Decryption of a page will fail if the password is incorrect, so whoever can decrypt the page must have used the correct password. The idea is that we don't have to know the password; we just have to make sure that the password is correct - and one way to check that is to try decrypting some well-known text using the provided password. The "well-known" text we're using is the URL of the current site (which is different, but known, for each site). Once a user creates the password, we store the encrypted URL, and each time the password needs to be tested, we just try decrypting the encrypted URL. If we get the expected URL, we try using the same password for decrypting the whole site (it's possible -- but very unlikely -- that two different passwords correctly decrypt the same URL, but using that wrong password for decrypting everything else will result in gibberish). Q: How does overwrite protection work? Q: How is the title of each tab computed? A: The title of each tab consists of up to 20 characters from the first non-empty line of text. Q: What encryption algorithms are used? A: ProtectedText.com uses AES algorithm for encrypting/decrypting the content, together will 'salts' and other know good practices to achieve exceptional security; and SHA512 algorithm for hashing. On top of that, all data is only provided through SSL. Q: Is the server code available somewhere? I'd like to host the service myself. A: We haven't opened the server code, for now. We'd like to provide perfect security to everyone, not just tech users. So we've created this approach where server side is irrelevant - that's the beauty of this service. Nobody should be forced to trust anyone in order to be secure; that's why all security is provided from the client side (which users can verify). Even if you knew the server code, you couldn't confirm whether that unmodified code was running or if it was replaced by something else. In other words: whenever a server's code is responsible for providing security, you have to trust whoever runs it. Q: How long do you keep sites on your servers? Will they ever expire? A: Sites are never deleted. We'll keep them forever, unless you delete them yourself. Q: Is there a length limit? A: The current maximum length is a bit more then 750 000 chars per page. Q: Is there some kind of self-destruct mechanism? A: We don't keep (and can't know) anything about you. All we have are encrypted versions of notes that users store on our servers, so once you delete your notes, that's it; there is nothing more to destroy. Warrant Canary: ProtectedText has never been served with a warrant or had seizures. If you have any comments, or suggestions - feel free to email us.